Around 30 student activists have been staging a peaceful blockade of both entrances to Senate House and Old Schools since 6am this morning, in protest of University connections to the fossil fuels and arms industries. The blockade, organised by members of Cambridge Zero Carbon, Cambridge Decolonise Network, Cambridge Defend Education, and Demilitarise Cambridge, is of five entrances to the University’s main administrative buildings. As of yet, students have not seen substantial attempts to move them or end the blockade – according to one activist, a security guard attempted to “push past” the protesters, but stopped when they “resisted”. Students participating have submitted a letter of demands to Vice-chancellor Stephen Toope as part of their protest, saying, “the gravitas of the situation and the failure of the usual democratic means have forced us participate in direct action, escalating our activity by blockading the entrances”, and inviting Toope to meet the protesters to discuss their demands. The blockade, which is expected to end at 12pm today, is a co-ordinated protest against the investments in, and relationships between, Cambridge and its constituent colleges and the fossil fuels and arms industries. Earlier this month, investigations by Varsity and Cherwell revealed that seven Cambridge colleges have investments in the fossil fuels industry totalling £20.7m, and investments in arms manufacturing corporations totalling over £6.5m. 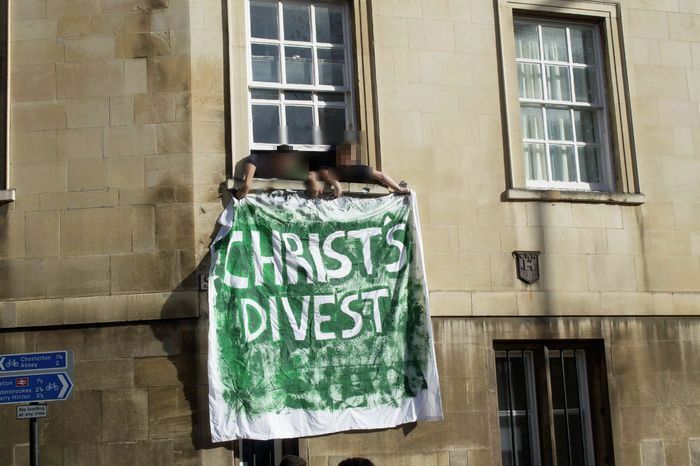 And over the past month, Cambridge activist groups have organised a number of protests, including a march through the centre of Cambridge calling for the University to “disarm, divest, decolonise”, a die-in at the Old Schools building, and banner-drops at 11 Cambridge colleges. Following the die-in at the Old Schools building last week, an message to Caius students by the college’s head porter said that the Senate House yard would be closed until at least Monday 3rd December, noting that “these sudden closures are becoming more frequent and we should expect this trend to continue”. In regards to today’s direct action, a spokesperson for the University of Cambridge said, “We are aware of an incident outside Old Schools, which took place and is now over."